Our custom window shades are a beautiful, long-lasting addition to your home or business. Modern homes are being built with large, beautiful windows. While you may love those windows during the day, at night, you want to feel private and secure in your own home. Our custom window shades are a great way to add real value to your space. Window shades are a great alternative to hard blinds and may feel softer in your space. Blackout shades: These are great for media rooms or nurseries. 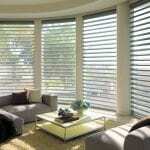 Cellular shades: If you are looking for energy-efficient shades, you may want these. Fixed shades: Does your home have arches, angles or inclines? Let’s talk about fixed shades. Roller shades: These are perfect if you are looking for something that is easy to clean. Panel track shades: These are a good option for your sliding glass doors or oversized windows. Roman shades: Looking for a stylish option? Roman shades never go out of style. All our window shades are custom made, which means they will perfectly fit your windows. If you want to learn more about our process or schedule a complimentary in-home consultation, give us a call today. We will bring all our samples to your home or business, so you can see all your options in the space where the window shades will be installed.